Havarti is available in flavors ranging from mildly sharp to strongly aromatic. 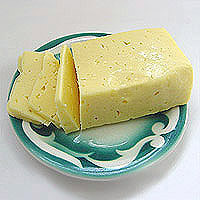 Havarti aged for about three months is full-flavored and creamy, and it gains a more distinctive taste as it ages. It may also be produced with extra cream, or with a variety of seasonings, including, dill and other herbs, spices, jalapeño peppers, or caraway seeds. Quality American Havarti is produced on a large scale in Wisconsin and New York state, and by artisan producers in California and elsewhere.